Jailed As I Lay Dying vocalist Tim Lambesis has filed a $35 million lawsuit against a medical team who he alleges denied him medication after he was jailed in 2014. CaseText report that the medication is anastrozole, which is used as a medication prescribed to combat the side effects of withdrawal from anabolic steroids. 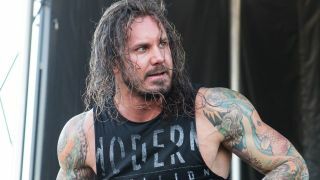 Lambesis claims he now suffers from gynecomastia – enlarged breasts – due to the hormonal imbalance caused by the failure to get the medication. Loudwire also report that while Lambesis’ punitive damages claim has been dismissed, his medical negligence claim will go to trial on August 8, 2017. After he was imprisoned, Lambesis’ bandmates Jordan Mancino, Phil Sgrosso, Nick Hipa and Josh Gilbert formed Wovenwar.